While visiting Nangarhar, Ghani declared, “If the Taliban want an office, I will give it to them in [the Afghan capital of] Kabul, Nangarhar, or Kandahar by tomorrow. We will bring a lasting and honorable peace to the country,” Reuters reported. Nangarhar is a Taliban and Islamic State (ISIS/ISIL) hotbed that sits on the border with Pakistan. According to the latest United Nations data, Kandahar and Nangarhar are among the top three “leading opium poppy cultivating province[s]” in Afghanistan, along with Helmand, the number one opium producing region in the country. Taliban jihadis generate most of their funding from cultivating and trafficking opium and its heroin derivative in Afghanistan. Despite nearly $9 billion in American taxpayer funds devoted to counternarcotics in the country since the war started in October 2001, Afghanistan remains the world’s top producer of opium and heroin, some of which is fueling the unprecedented fatal drug overdoses killing tens of thousands in the United States annually. Our demand about having an official political office is clear, we want that our office in Doha is recognized by the international community and the United Nations. By this, Ghani is trying to change the topic and harm the on-going peace efforts. The Taliban’s rejection is a testament to the group’s reluctance to allow the Afghan government, which the terrorists consider to be an American “puppet,” to participate in ongoing peace discussions. One of the primary points of contention as the jihadis negotiate peace directly with U.S. President Donald Trump’s administration is the Taliban’s refusal to allow Kabul to play a role. Trump administration officials have intensified peace talks with the group as part of the U.S. president’s Afghanistan strategy to end the more than 17-year-old war. The “political reconciliation” between the Taliban and Kabul is the primary goal of Trump’s South Asia strategy. In February 2018, Ghani extended an unconditional olive branch offer to the Taliban of a ceasefire and official recognition as a legitimate political party, but the terrorist group continues to renege on allowing the Afghan government to participate in the ongoing peace discussions despite America’s insistence that the process is led and owned by Kabul. On Sunday, Ghani renewed Kabul’s commitment to offering legitimacy to the Taliban. The Afghan president reiterated that he is willing to “pay an ultimate personal price and offer his head (lay life)” in exchange for lasting peace, Khaama Press (KP) reported. He said his administration must play a role in the ongoing peace talks. Afghanistan’s Chief Executive of the Government of National Unity Abdullah Abdullah, who is ruling with Ghani as part of a U.S.-brokered agreement, attributed the ongoing conflict in Afghanistan to the “stubbornness” of Taliban leaders. Trump’s peace envoy Zalmay Khalilzad is reportedly expected to meet with the Taliban for another round of talks on February 25. 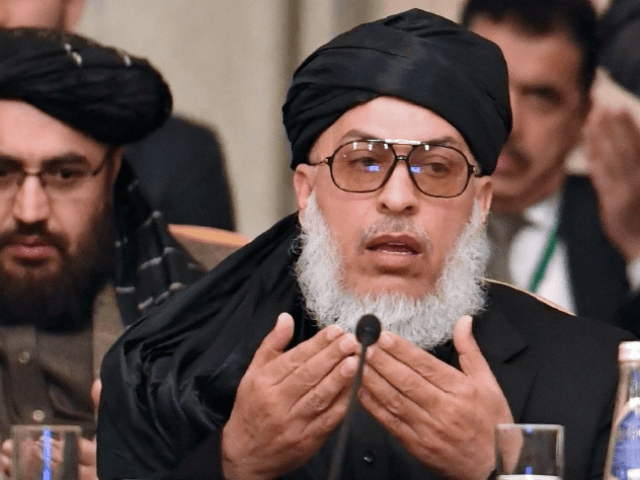 In exchange for a withdrawal of foreign forces, the Taliban has reportedly agreed to prevent any other jihadi group including their al-Qaeda allies and ISIS foes from planning or carrying out attacks against American interests from Afghan soil. For years, the Pentagon has described its mission in Afghanistan as preventing the country from becoming a haven for international terrorists seeking to attack the American homeland. In his State of the Union address last week, President Trump indicated he is willing to withdraw the American troops from Afghanistan, but stressed that he would leave behind a residual force to ensure the Taliban keeps its promises. While the Taliban has come out against any foreign troops remaining in Afghanistan, the group expects the United States to continue footing the bill for reconstruction. U.S. nation-building efforts mainly include American taxpayer funds devoted to developing the Afghan security forces, which may include Taliban fighters if a peace pact is achieved. The Trump administration has come out in support of Ghani’s offer of legitimacy to the Taliban, a move that would effectively grant the terrorist group an opportunity to return to power. Soon after the United States invaded Afghanistan in October 2001, American troops ousted the Taliban regime that had been in power since 1996. Terrorist groups, mainly the Taliban, already control or contest more than 45 percent of districts across Afghanistan where over 35 percent of the population resides, a U.S. watchdog agency revealed at the end of last month. Taliban-held territory mainly lies in rural areas. According to the Pentagon, the Afghanistan-Pakistan region is home to the highest concentration of terrorist groups in the world.